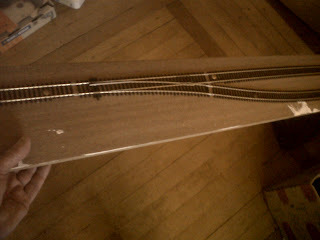 French Model Railway: Wiring points for DCC part 3. If you look at the diagram in yesterday's blog, the following will make better sense. 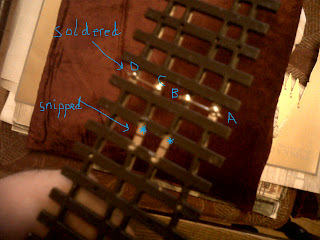 Basically, today I snipped the two tiny wires underneath the points - at the location marked with *s in yesterday's diagram. These tiny wires have been tormenting me for months but now they've been snipped. This act reminded me of an incident in an old Eric Sykes sit-com where he is wandering around the house bored and walks over to a vase of dafodills on the window sill and with a pair of scissors cuts off one of the heads. When asked by his live-in partner Hattie Jacques why he had done such a needless thing, he said that it had been staring at him. The second task was to wire up the 2 legs of the hinged part of the points with their adjacent rails. As I say, see yesterday's diagram for the significance of the *s and A, B, C and D.
These two tasks took a total of 5 minutes. I explained in an earlier blog that this is a practice set of points that I'm going to wire up on a mini test layout. (See picture below.) But, if it works, then I'll modify the several sets of points for the actual layout en masse a la Henry Ford. Off to the Kelvingrove Museum, Glasgow to see the highly-esteemed Tallis Scholars perform this famous piece of 17th Century sacred music. The story goes that the piece was only permitted to be performed in the Sistine Chapel and thus no scores were available for general release. One day, so the story goes, the child Mozart on tour of Italy with his father heard the piece performed in the chapel, committed it to memory after one hearing and then wrote the score out when he got back to his hotel room. (Sounds a bit like the action of a hacker or a pirate file-sharer of nowadays). It's a beautiful soaring piece of choral music. But sometimes I wonder if it's a bit schmaltzy. Anyway, am curious to see the Tallis Scholars.